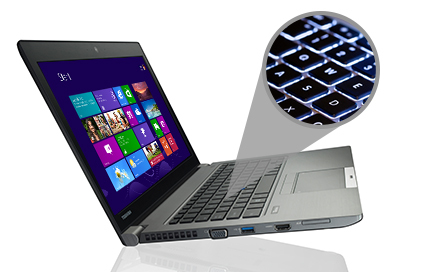 Toshiba Tecra Z40-A-19G 14" Light Weight Laptop Core i5-4310U, 8GB RAM 500GB HDD. The Tecra Z40-A is ready for business wherever they are. With a very low weight starting at only 1.4 kg and with an incredibly robust design, this is the perfect travel companion. Even without a backup battery, you will get a range of up to 9 hours. If you are outdoors or in a very bright environment, you will not miss a detail thanks to HD screen anti-reflective 35.6 cm (14 "). It is very easy to send e-mails or to produce reports and presentations even when you are away from the office - even in a dimly lit environment, because the laptop has a backlit keyboard. 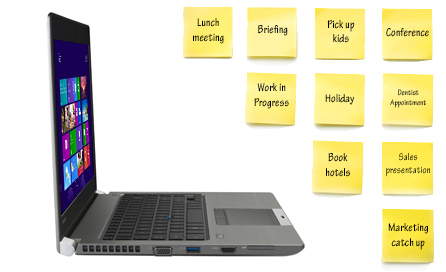 Intel® Core  processors deliver the performance you need for multi-tasking. Tecra Z40-A offers ample space for documents, higher speeds and reduced response times from the second to power on and when you close it. This notebook makes no compromises in terms of performance, so you can run any business application effortlessly. One of the basic words that characterize Tecra Z40-A is flexibility - as all installed ports are standard size, you will not need any special adapter for connecting peripheral devices. Data transfer is very fast thanks to three USB 3.0 ports. The HDMI connector will prove very useful when you must display a presentation on a monitor or screen extra large. Access to the local network will be very fast using Gigabit LAN port. Connecting to other peripheral devices is done very quickly and easily using the optional docking station that is compatible with any model new range of Toshiba business. Slot for SD cards also increases storage space you have available. Tecra Z40-A is an extremely sturdy laptop that was designed to withstand the pressures of work and to meet quality standards Toshiba. Thus, it has passed the rigorous test HALT (Highly Accelerated Lifestyle Test), simulating the use of the equipment for 3 years. German independent institute, TÜV Rheinland®, the subject also a test device shockproof to a height of 76 cm and one resistance of the keyboard splashes of 30 ml of liquid. 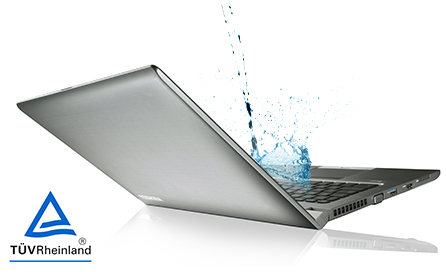 Thus, if accidentally spilled drink, you have time to close the notebook and protect your data *. Because housing light but resistant, Magnesium, Z40-A is a solid device that will prove, over time, an excellent investment. Tecra Z40-A is designed for business and comes equipped with a range of security and management features that bring obvious benefits to users. Drives and self-encrypting system Trusted Platform Module (TPM) protects critical data. If needed as applications installed on Z40-A to be updated, the IT department colleagues do it any time through Intel Active Management Technology (AMT). Thanks fingerprint reader is very simple and safe logging, while 3D sensor takes care of your data if you drop your laptop away. Toshiba continues to improve its products to meet as many of your business needs.Thus, we opted for a quiet cooling system and a better quality speakers for model Z40-A for added performance and ergonomics. Thanks to HD screen, back-lighted keyboard, but also equipped with large touchpad and Accupoint is much easier to browse the web or in applications. 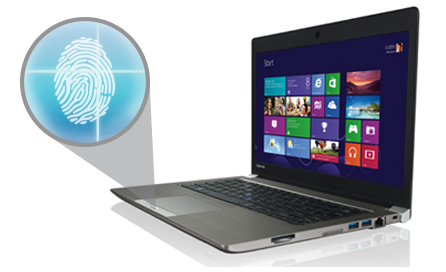 A large number of design features Tecra Z40-A are common in the new series of Toshiba business notebooks, to ensure harmony between devices within the company, regardless of the models you choose. Due common docking station, it's easy to have access to peripheral devices using a range of ports. 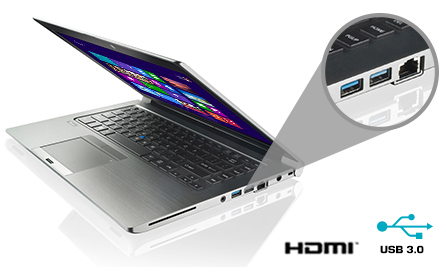 For added convenience and flexibility, Z40-A offers HDMI inputs, RGB, three USB 3.0 and Gigabit LAN. 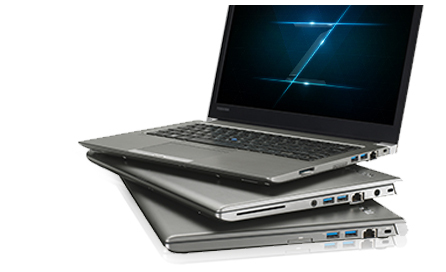 All laptops for business from Toshiba are equipped with the same software, so the customization is easy. Moreover, fingerprint reader, non-CSV screen, integrated webcam, magnesium casing, Accupoint and connector for the docking station are also provided as standard.